First Club Ride Back After "the Incident". After 9 lonely weeks, with many nights spent in the pain cave peddling to nowhere, I finally got out on the road with the club! And, what a doozie of a day it was. To begin, I was absolutely resplendent dripping in black PTC gear. If Trevor Goller had a thought of how this look would be executed when he designed the kit, I was it. It was black on black, with more black. If the Navy Seals rode bikes, I think it would be their look. Now, you gotta suspend disbelief just a bit. Imagine the black arm warmers, black wind vest and of course, black Capo wool socks. Any ways, time was tight and after my absence from the outdoor saddle, I decided the Madone and I would take the car to Jones to start the morning. The fact that I would save 16 miles round trip and almost an hour of riding had nothing to do with it. 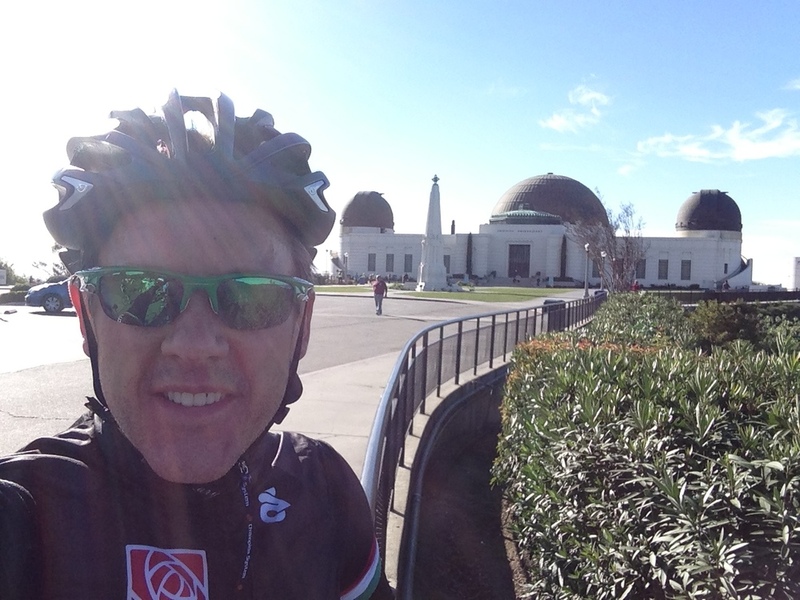 The route seemed simple enough - 1 lap around the city of Glendale with a stop at the Griffith Observatory and a finish of strong coffee at Jones. We headed into Old Town Pasadena, over Suicide Bridge and then through North Eagle Rock. The tempo was brisk, but the group was chatty. I tried a feeble attack over the bridge, down hill no less, but was quickly reeled in. Belgian Ben and Ryan, "Prefontaine", were having none of it. Certainly not this early in the game nor down hill for that matter. Once we hit Colorado Blvd near the 2 freeway, our mechanicals took their toll. Gregg Doyle's aerobar end shifter was hanging out the end like a noodle. The madman was on a TT Bike! He bravely told us to leave him for dead in indian country while he executed a fix. Only a few miles down the road, disaster struck again! Just after turning on to Mountain, on a little "kicker" of a hill, Ken Rudman snaps his rear derailleur hanger off the frame. Unreal! Doode was putting down a few watts, but that was just wrong. I was within earshot and it sounded like a bus a ride was in his future. Ken later confirmed as much. Later I remember counting him among the lucky ones. He was not chasing the Belgian fresh from 14 weeks of Endurance Nation Outseason training around Glendale. Not long after turning off of Sonora near the 134 freeway the "third" happened. This time it was the directionally challenged Belgian ride leader. During a quick regroup, I noticed his tire begin to spit white latex from a hole it didn't have before the ride started. The prescription was to let it harden, sealing the hole before we continued . One fellow recommended that it might harden faster if he stroked it while other extolled the virtues of natural lamb versus latex for various uses. With a simple "what's the worst that could happen" from Ben, we were off again. Now, there was so much climbing that after downloading the file to Training Peaks, I received and an email from TP informing me that I had bumped my threshold from my post injury, indoor 237 watts to a new 255 watts! So much for my easy ride. I was obviously committed to "training through" this 1/2 marathon in the morning. 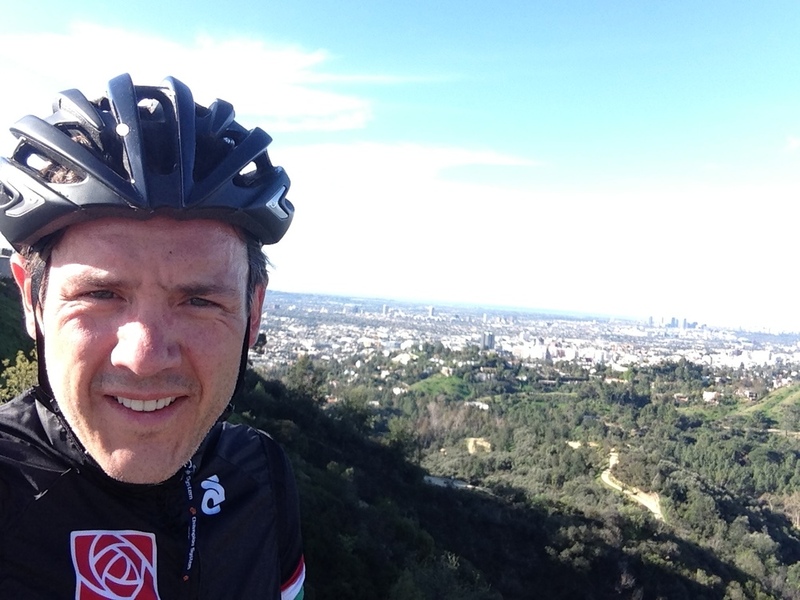 Once at the top of the Griffith Park road that would not end, we were rewarded with scenic views of Los Angeles! From Downtown to the Westside, she was all spread out for us. You could even see Catalina. The Westside - you can see the traffic! Our Ride Leader - Big Ben, King the Mountains! From the safety of the observatory, we began our decent into Los Feliz. Hipsters beware! The ride from the bottom of the hill to path was uneventful. It was smooth sailing now. Our primary objective achieved, we were on our way to coffee. As soon as we hit the path though, our ride leaders "Green Light Blood" kicked in and we were off and running. The breakaway was Ben, Bill, Prefontaine, Softride Antone, Jaime and myself. The pounding started and we were rolling. Building faster and faster like a train with no brakes. Just like Gene Wilder in the boat from "Willy Wonka". At this point, Bill, the only guy who actually knew the route, started to scream something that sounded sensible, however unintelligible. He seemed to know what he was saying, but the belgian didn't care. Green Light Blood had taken hold and he had turned his nose into the wind. Nothing but open bike path lay ahead. As Bill dropped off the back, my only thought was hang on to the wheel in front of me. Damn the rest. Just hang on. We took of a number of good strong pulls as we sizzled down the trail at 25-26 miles per hour. A call from Lynda and a text from Derek spelled disaster. We circled back expecting to see a pile of broken carbon bikes only to ride all the way back to Los Feliz without finding anything. That's when it sank in..... We missed the turn! Madness! Did I mention that from Fletcher it is basically all up hill until you get to Colorado Blvd. and Orange Grove in Pasadena?